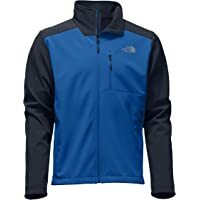 Get The North Face Mens Apex Bionic 2 Jacket (Turkish Sea / Urban Navy) from Moosejaw.com. Founded in 1992, Moosejaw.com is an online retailer specializing in outdoor recreation apparel and gear for snowboarding, rock climbing, hiking, and camping. They have vision to create an unique culture of designs and global style.Moosejaw.com has many awards to its name in top 50 retailer in various retailers. The Moosejaw Living Will is their Product Guarantee. They also do price match. Under Moosejaw Affiliate program, they continuously work to keep publishers informed of sales, promotions, and exclusive deals. Moosejaw is known for its nonsensical marketing called 'Moosejaw Madness'.